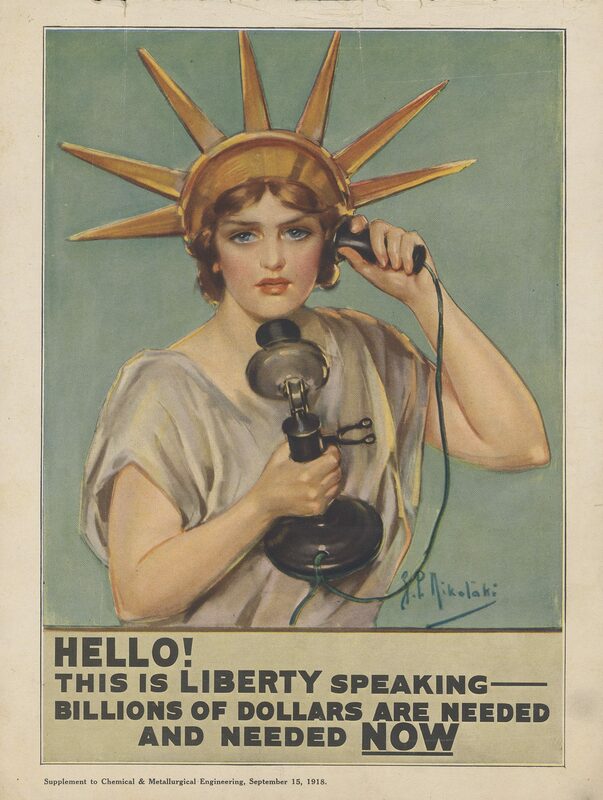 World War I posters have been described as “the first large-scale use of the poster for political purposes.” As in so many other ways, these posters illustrate how World War I was the first modern war, using familiar images to engage all sectors of society in the war effort. 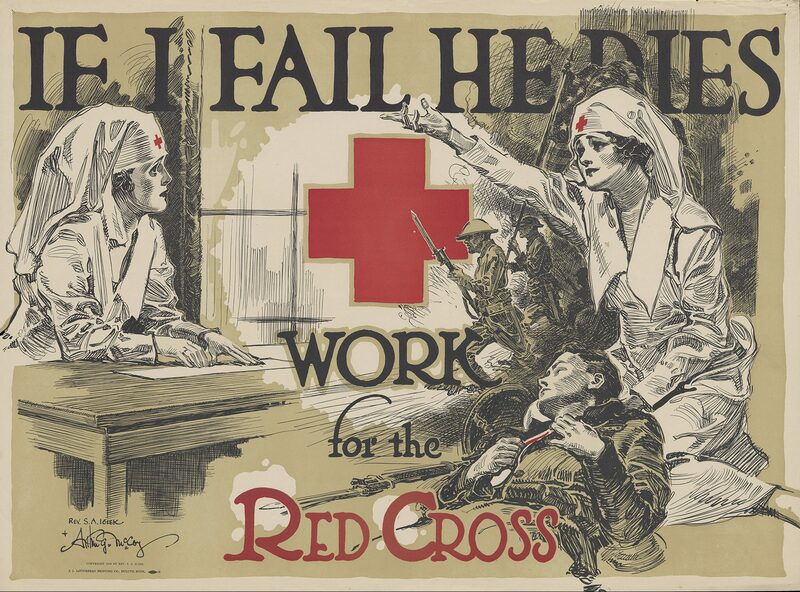 Posters were an important tool in encouraging as many men as possible to do their duty and join the armed forces. 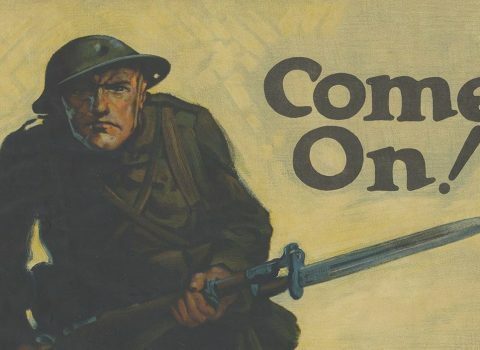 Many images glorified the soldier’s bravery and skill, and themes of loyalty, heroism, and adventure played a role in recruitment strategies. 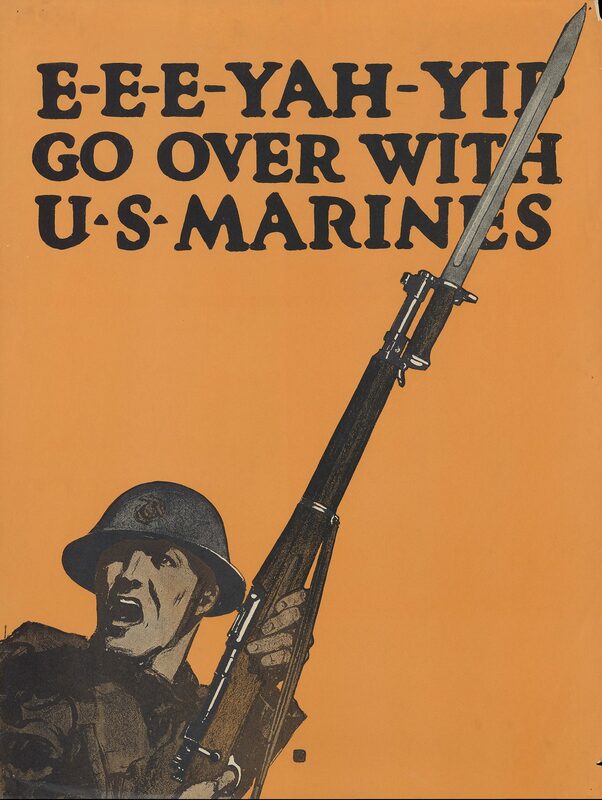 “E-E-E-YAH-YIP” was a popular Marine battle cry used to rally recruits and instill camaraderie. 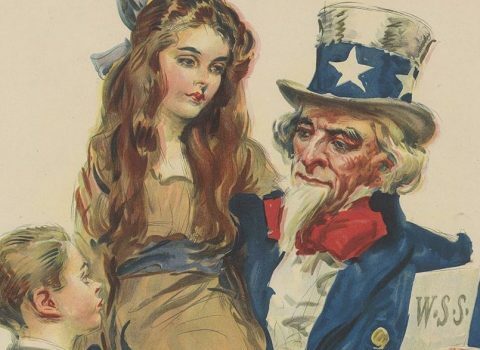 1918, Original vintage World War 1 Poster issued for the United States Shipping board – Emergency Fleet Corporation. 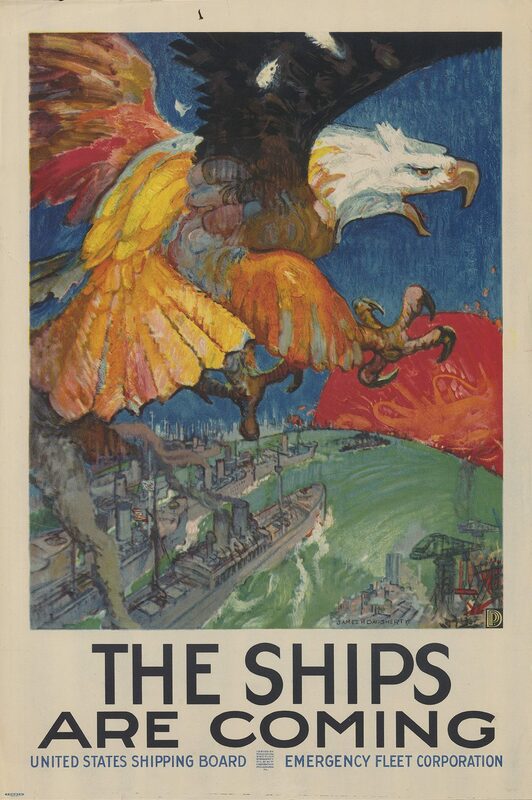 This colorful poster depicting a very dramatic and colorful American Eagle flying over a fleet of warships emerging from the shipyards was designed by James Henry Daughetry, (1889-1974). 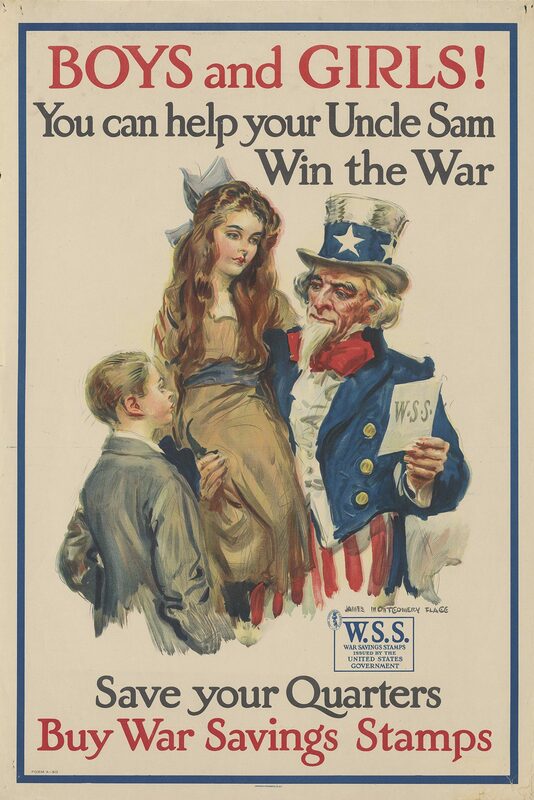 Many posters were aimed at raising money to finance the war. 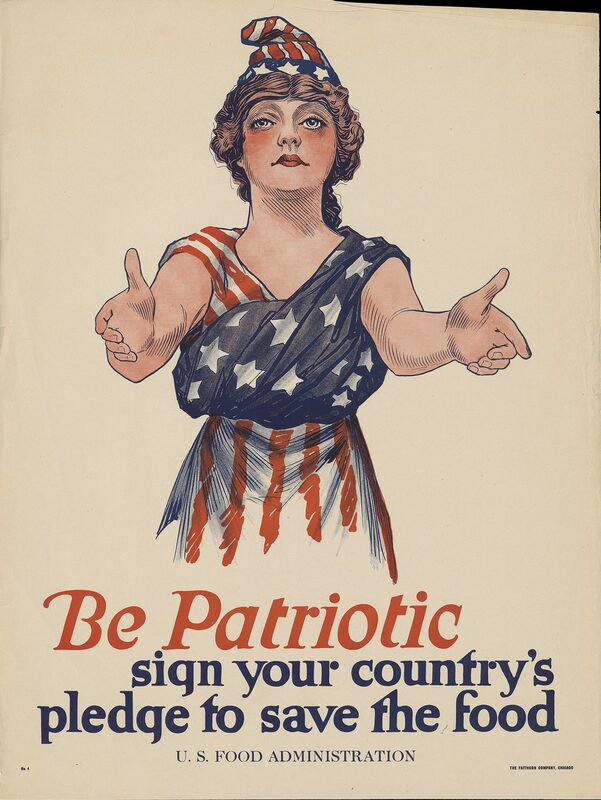 Those who did not enlist were asked to do their part by purchasing bonds or subscribing to war loans. 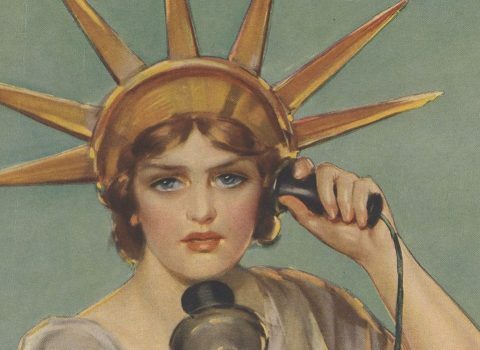 National symbols of patriotism and freedom, like Uncle Sam and Lady Liberty, and a U.S. soldier crushing the enemy were used to illustrate the point. 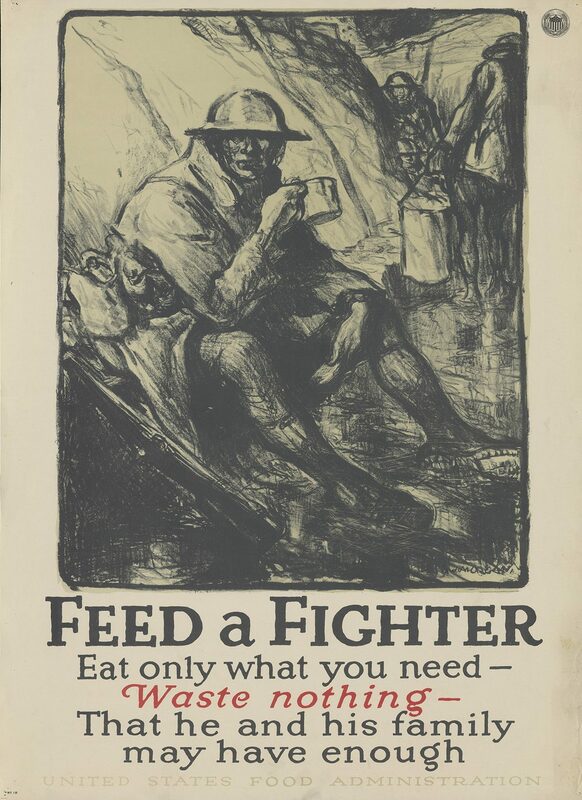 Food shortages were widespread in Europe during the war. 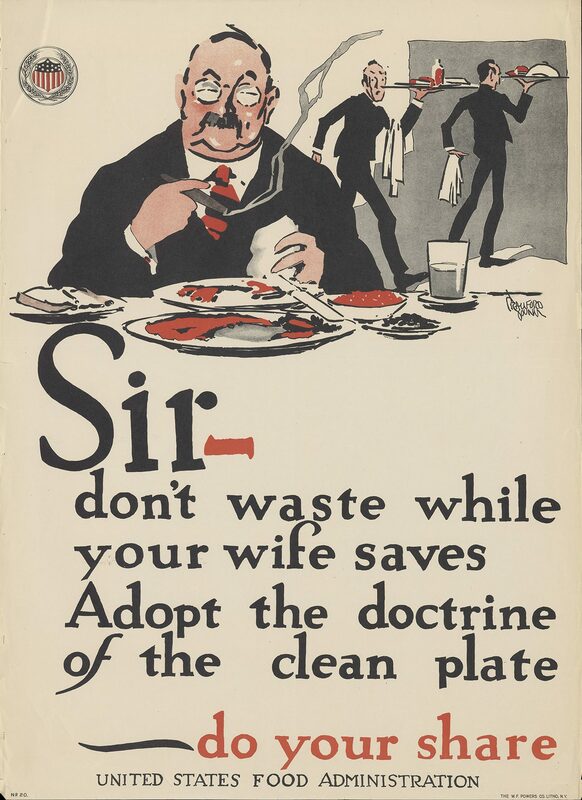 On the home front, Americans were asked to conserve food so that allies in Europe would not go hungry. 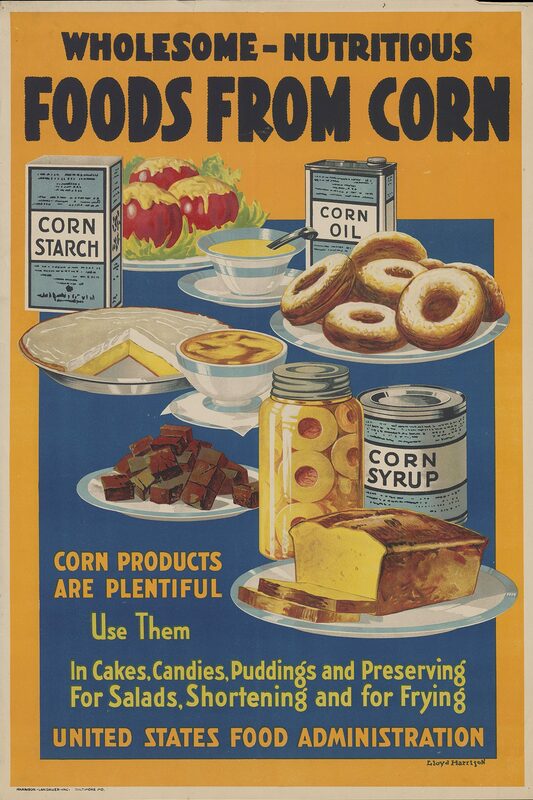 They were encouraged to plant victory gardens, go meatless and wheatless, and eat more corn and fish. 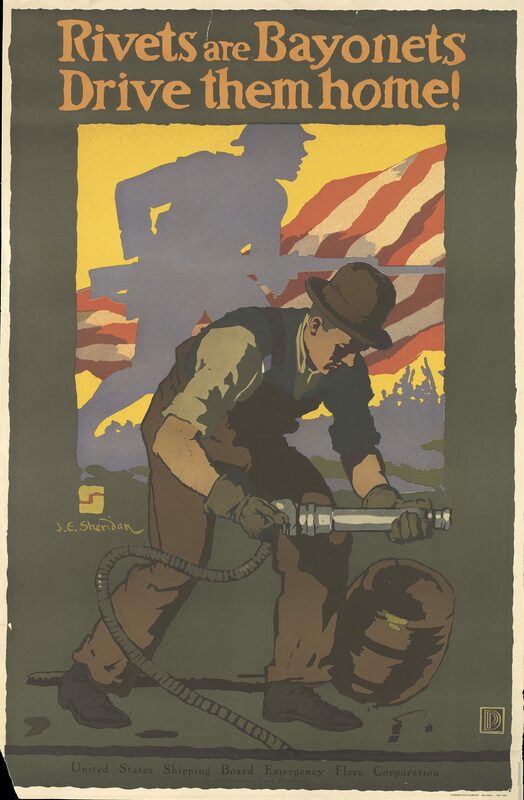 The industrial worker was invigorated by posters that presented their work at home as being just as important as military service overseas. 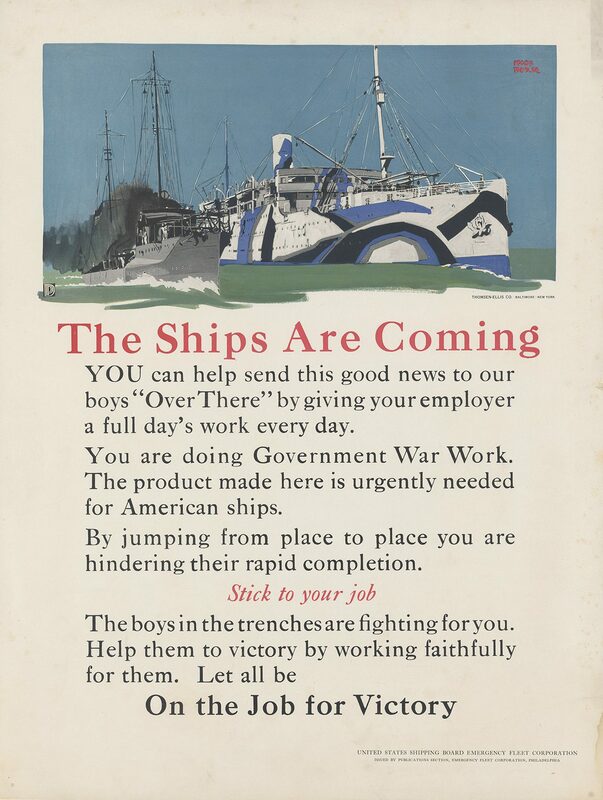 Images that depicted their tools as weapons and demonstrated the urgent demand for merchant ships were used to encourage them on the job. 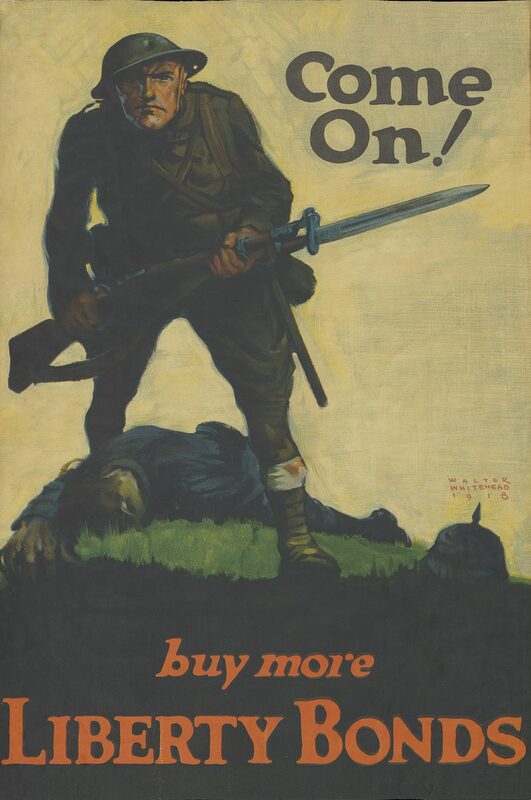 Rivets are bayonets – drive them home! 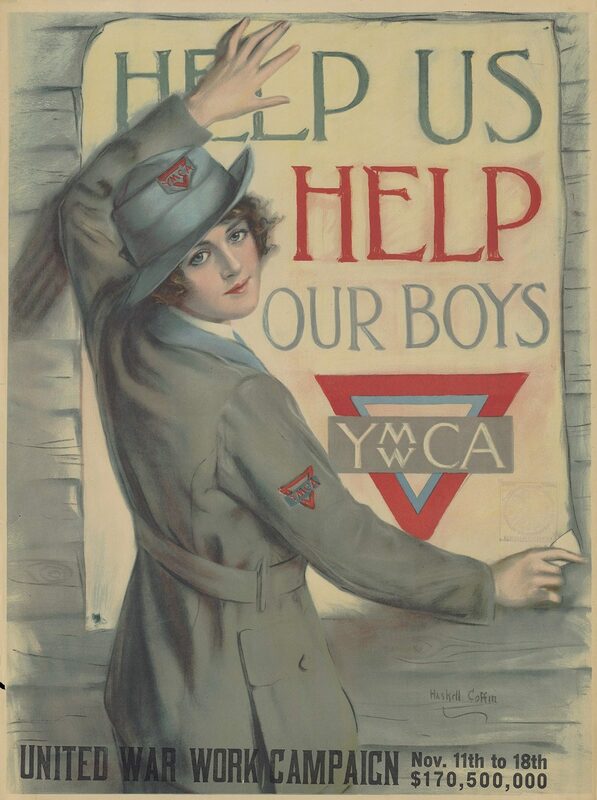 Americans who were not being recruited for the military were also asked to do their part by serving in relief organizations such as the YMCA, YWCA, the War Camp Community Service, and the Red Cross. 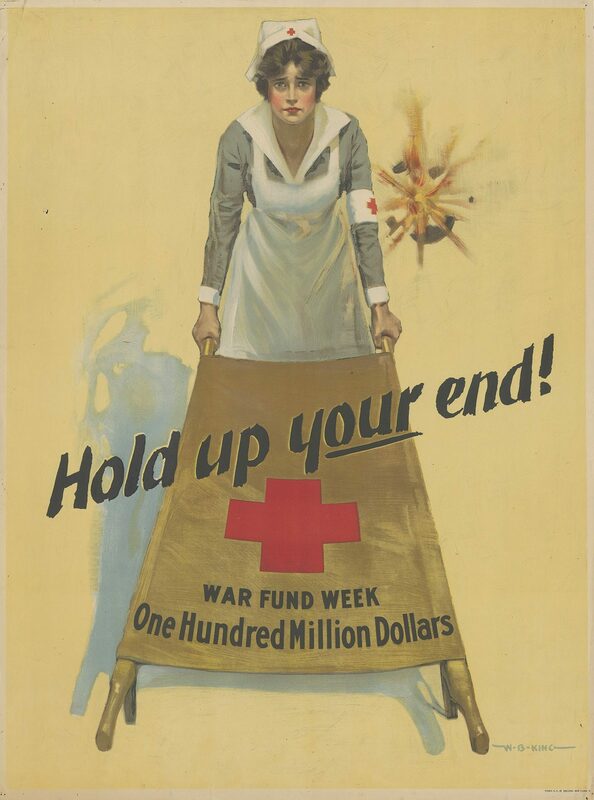 Fundraising efforts for these organizations were stimulated by images of Red Cross nurses helping wounded men and soldiers enjoying war camp entertainment. 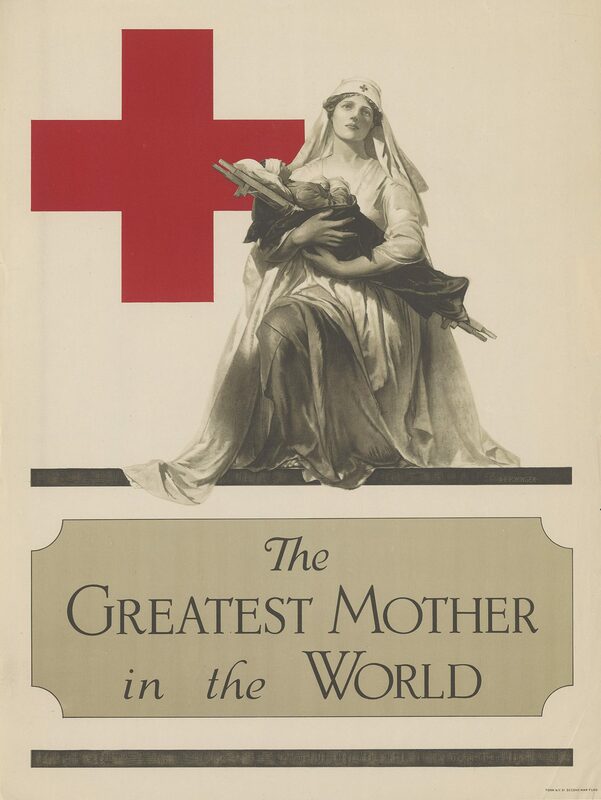 This collection is housed in the Government & Geographic Information Collection of Northwestern University Libraries. The complete digitized collection is forthcoming.